On November 4, 1646, Sir Theodore de Mayerne (1573–1655), first physician to Charles I and the English Aristocracy, decided to spend his day away from his demanding patients and to devote his attention to the vibrant world of colors. He took a good handful of bilberries and carefully inspected the color of their peel and pulp. He then cooked them following a recipe for making a “very beautiful and very oriental” colorant for writing and limning. The recipe he followed has survived as part of an extensive manuscript collection dated to the first half of the seventeenth century. Fol. 23v from MS Sloane 2052, written in an unidentified hand. The annotations in red and the gloss in the margin are in Mayerne’s hand. Source: British Library. The folio contains strike-throughs, contemporary annotations in red ink, a gloss in the margin, and an intriguing set of color sampling. Apparently, Mayerne’s manucript collection, to which this bilberry recipe belonged, was well-used and continuously expanded: many of its annotated records are dated, spanning a period of more than twenty-five years from about 1620 to 1646. Today this manuscript, better known as The Mayerne Manuscript, is renowned among art historians and painting conservators, as one of the most important technical handbooks for seventeenth-century color making and oil painting techniques. This invaluable source for premodern art technologies provides an intriguing case study to explore how manuals are made and remade by many hands. It also calls for a closer examination of the notions of the “artists’ manual” and “craftsman’s handbook” that pop up frequently in its historiography. Let us return to the bilberry recipe that Mayerne had collected, annotated, and performed. This recipe has likely been copied from another source, linking it to Northern European textual traditions of color making with organic colorants that extend back for centuries. Similar recipes appear for example in anonymous late medieval compilations and in illumination manuals. These were often produced and copied in monastic contexts, like the anonymous late-fifteenth-century manuscript known as the Schwäbische Chronik, in which the daily prayers of canonical hours can be found next to color-making and culinary recipes. Yet Neven’s newest critical edition of the Strasbourg Manuscript (2016) provides a much more nuanced view on the complex transmission and user histories of this Medieval Tradition of Artists’ Recipe Collections (1400–1570). Many of the illumination recipes survived in monastic scriptoria rather than in artists’ workshops, where they were copied over and over—but perhaps not used—over long periods of time. And yet, we still can speak of a living tradition. The performative force of these medieval how-to texts is resuscitated in today’s conservation laboratories, where they inform experimental reconstructions of historical art technologies. The Strasbourg Manuscript is often compared to the most famous of all artists’ manuals: Cennino Cennini’s Libro dell’arte, written in Italy more than 500 years ago and a true “longseller” on the global market. 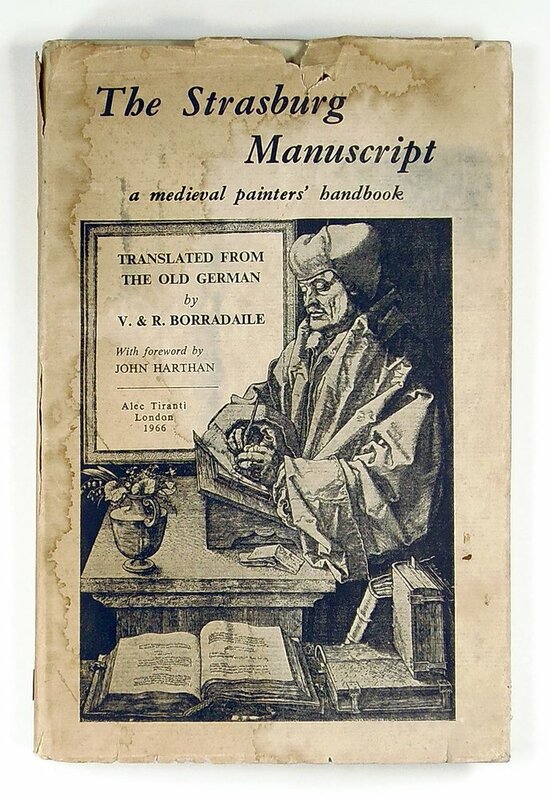 As part of the core curriculum in Western art history and painting conservation, The Craftsman’s Handbook, has accompanied generations of students since it was translated into English and published as a cheap and handy pocket edition by Dover in 1958. [T]here are many who say that they have learned the profession without having spent time with masters. Do not believe it, for I offer you this book as proof: if you study it day and night but do not get any practice with any master you will never come to anything, nor could you ever hold your head up amongst masters. Many will probably agree with Cennini that the fine art of painting can best be acquired by doing and not by reading. For the surviving sources from the pre-modern period, this raises the still much debated question: Why write a manual? Back to berries. Another strikingly detailed berry juice recipe includes instructions for preserving the extracted color by soaking a clean piece of cloth with the colorant and letting it dry—a common procedure to prevent organic colorants from rotting. It can be found in the Liber illuministarum. This “book of and for illuminators” dates to the end of the fifteenth and the beginning of the sixteenth century, when it was compiled, copied, and enlarged in a monastic scriptorium/workshop. 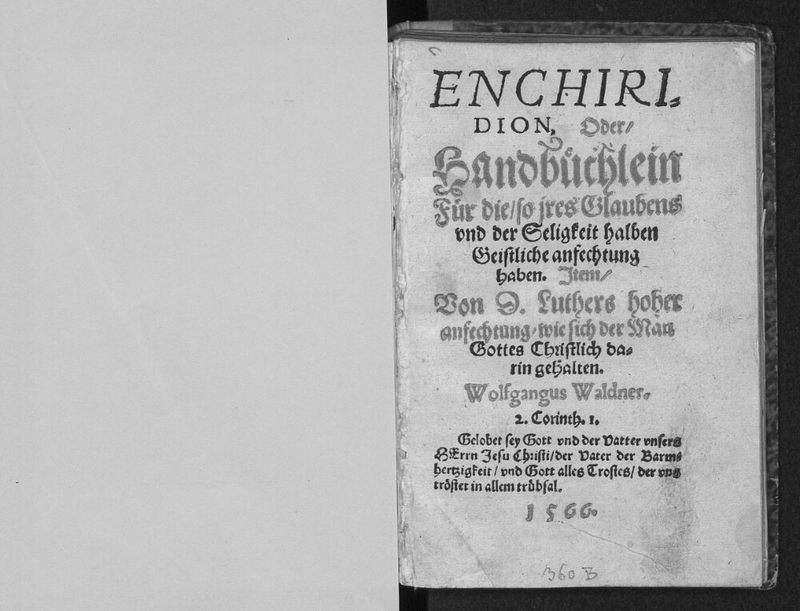 Boltz’s small manual, printed in hand-sized duodecimo format, has been described as a “Mallehre” and “Lehrbüchlein,” a German word-composite that literally translates as “painting apprenticeship” and “apprenticing booklet.” Interestingly, only three years later, the format and dedication of the Frankfurt 1552 edition targeted a non-professional German readership of letter painters (Briefmalern) and amateurs (Künstenliebhabern). The Newberry Library has an exceptional example of such daily-used spiritual manuals in their collection: one of the very few surviving book of hours in girdle binding and a tangible reconstruction of a girdle book. Portable prayer books figure also prominently in pre-modern imagery. The many painted, easy-to-carry booklets testify to their popularity in the past. Correspondingly, the OED defines “handbook” etymologically as “a book small enough to be easily portable and intended to be kept close to hand,” deriving partly from post-classical Latin manualis and its Greek etymon enchiridion. Pre-modern examples in German (hantbōk, hantbuch) can be found as early as the fourteenth century and in Dutch (handboek) mentioned in texts at the beginning of the sixteenth century. (OED, ‘handbook’). All this seems to suggest that in the pre- and early modern period the concept of the “manual” or “handbook primarily connoted a book’s physical aspects, its ready-to-hand format, size, and portability, and had no direct associations with its content. A quick search for “handbooks” in the Universal Short Title Catalogue, a collective database for books printed in Europe before 1700, confirms the impression that early moderns commonly used this term to refer to portable books of various, but mostly spiritual contents. A short title search yields matches in the categories “religion” ( for example, in 1520 and 1566) and “jurisprudence” (on imperial and civil rights, for example), but not “art and architecture.” Current associations with hands-on learning or written instructions for manual operations were in the past apparently not as readily associated with handbooks as they are today. An interesting distinct category are the medical handbooks that flooded the Northern European book markets in the same period. 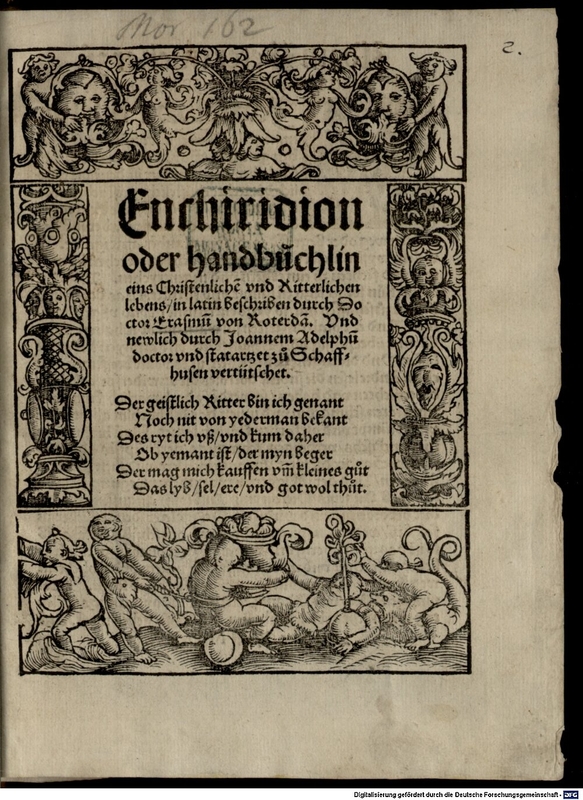 For example, Hieronymus Brunschwig’s Chirurgia das ist handwürckung der wundartzney (Augsburg, 1534), which explicitly references the surgeon’s “handiwork” (handwürckung) in its title. Good examples of this tradition are also the many sixteenth-century editions of Walther Hermann Ryff’s manual and Practicirbüchlein and Carel Baten’s bestselling surgeon’s handbook, printed ten times in the Low Countries between 1590 and 1632. LEFT: Hieronymus Brunschwig, Chirurgia (Augspurg: Weißenhorn, 1539), Bayrische Staatsbibliothek VD16 B 8707. RIGHT: Walther Hermann Ryff, Manual Buchlein. Von allerhandt Gifft, Wunden, unnd Feldt Kranckheyten eyn kurtzer Bericht (Strasbourg: Jakob Cammerlander, 1538), Herzog August Bibliotheek Wolfenbüttel VD16 R 3971. Flemish booksellers also published merchant’s manuals featuring woodcut illustration of coins, like the tiny Cooplieden handboucxkin, which fits into the palm of a hand. 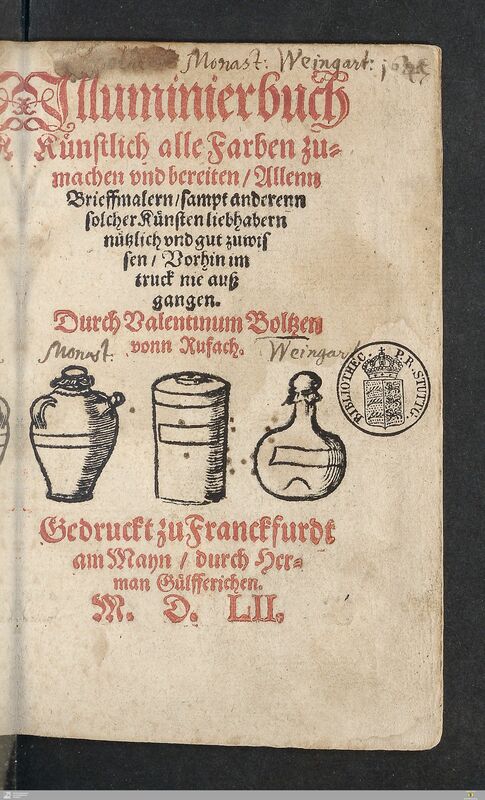 I imagine that a merchant kept it open with one hand, allowing him to hold a coin in the other to compare with the illustrations. This cheaply produced trade tool, was also marketed in a high-end French edition with unique artistic features and a veritable merchant’s toolkit integrated into its binding: Le Manuel des Marchans moult utile a trestous. This little jewel (109 x 72 mm) sold in 2006 for a small fortune at Christies. Jenny Boulboullé is a postdoctoral researcher in the ERC Artechne Project, Utrecht University, and guest researcher at Conservation and Restauration, University of Amsterdam. Her Twitter handle is @jennyboulboulle. Suggested Citation: , “The Manual as Artifact: On Artists’ Manuals and Craftsmen’s Handbooks,” History of Knowledge, June 4, 2018, https://historyofknowledge.net/2018/06/04/manual-as-artifact/.